IRVINE, CALIF.--(BUSINESS WIRE)--American Industrial Systems, Inc. (AIS), an open platform, PC-based Human Machine Interface (HMI), Industrial PC (IPC) units and turnkey engineering and manufacturing solutions provider, announces their “Design for Smart Manufacturability Services” (DMS) for new modularized HMI systems that are easily serviced and replaced by customers in the field while maintaining high productivity with the least amount of downtime and disruptions to their operations. The new HMI touch panel design from AIS maintains the same technical powerful features, capabilities and performance of their traditional panel mount-type HMI PC, but adopts a modularized design which meets the needs and requirements of an open, smart manufacturing technology platform. Furthermore, a highly modularized design offers AIS’s customers many other worthwhile benefits, such as higher product availability, maximum uptime and a lower Total Cost of Ownership (TCO) for the lifecycle of the AIS HMI control and monitoring solution. Companies are always searching for new ways to achieve maximum productivity and Overall Equipment Effectiveness (OEE). Typically, this is achieved by utilizing the most advanced control and monitoring solutions and technologies available that will increase performance, throughput and the speed of their machinery or process. Obviously, the faster and more efficient the production line, the higher the output and return on investment. However, the longer an HMI system can stay in production without failures, problems or in need of service, the more productive a plant’s operation can be – keeping their machinery and production lines working at full capacity and operational efficiency. In addition, to their high performance, broad feature set and advanced visualization capabilities, the new open platform, PC-based HMIs from AIS are also modular, easily replaceable and upgradable. The flexibility of an AIS modular HMI system will help customers maintain their production goals and targets. Thanks to the AIS in-house Design for Manufacturability team, products are designed and engineered properly at the onset to ensure long life, high reliability and availability. AIS HMI Display and IPC units are designated as either Field Replaceable Units (FRUs) or Customer Replaceable Units (CRUs) that can be quickly and easily upgraded or repaired. AIS’s new modular, open technology PC-based HMI designs minimize field service and replacement costs for customers maintaining control and monitoring systems. Estimated in thousands of dollars or more for repair expenses, the cost for equipment downtime and maintenance coupled with service technicians required to perform the work can be an expensive burden for plants. In remote areas such as off shore production platforms and drilling rigs in the Oil & Gas industry, the expense can be even greater. With open and modular HMI systems from AIS, only the box PC unit needs to be replaced, without having to ship an entire new HMI system to the facility. Replacement is fast and easy and improves Product Lifecycle Management (PLM) for OEMs/ODMs and end-users. In addition to the cost of field technicians, repair and service personnel, having to maintain a spare parts inventory sufficient enough to replace and service HMI control and monitoring systems in the field, adversely affects supply chain performance for users who utilize proprietary or fixed-type HMI systems. A large parts inventory not only consumes large amounts of valuable capital, but adds complexity to the supply chain dynamic as well, making high availability difficult and too costly for users. With a modular and flexible system design, AIS’s PC-based panel mount HMIs can be upgraded or replaced with a common box PC component, so customers will need fewer spare parts inventory and therefore greatly reduce inventory redundancies and costs. The modularized HMI Touch panel PC increases sustainability in terms of resource product lifecycle management and supply chain performance. It allows flexible OEM/ODM manufacturing, system integration, and better asset management for industrial control system (ICS), distributed control system (DCS), programmable logic controller (PLC), supervisory control and data acquisition (SCADA), and manufacturing execution system (MES) solutions. AIS’s newest family of industrial PCs feature a highly modular design and provide a complete range of HMI solutions that allow touchscreen display and Box PC built to specific customer needs and requirements. 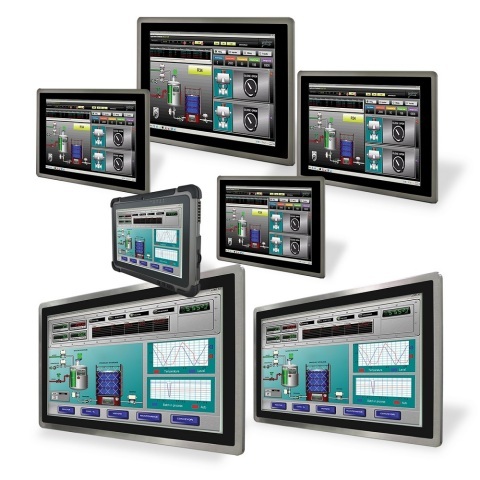 AIS’s modularized HMI panel PCs are configured to suit a wide variety of applications including: Chemical Manufacturing, Water & Waste Water Treatment, Pharmaceutical, Energy, Food, Oil & Gas, Automotive, and others. Several new internet-based technologies will now provide almost unlimited control, monitoring and visibility, giving users more analytic power to improve actionable decision making. The Internet of Things (IoT) will connect a wide network of intelligent devices that will increase automation in factories, plants and buildings. Made possible by wireless connectivity and internet technologies, M2M and Field Mobility are bringing solutions to new areas not accessible previously or easy to reach for users. Converging HMI, SCADA, MES and Field Service Management (FSM) platforms help users better visualize both key automation and business metrics. Companies can improve measurement and evaluation of Overall Equipment Effectiveness (OEE), TCO and energy. Headquartered in Irvine, California, USA, American Industrial Systems, Inc. (AIS) offers in-house electronic and mechanical design, software development, Manufacturing, Production and Quality Control Services. Offering one of the widest ranges of Industrial Computing solutions, AIS solutions are available in a multitude of configurations for Industrial, Oil & Gas, Military and Marine applications. The company is fully committed to empowering, improving and delivering turnkey HMI, monitoring and display solutions for OEM, ODM and end-user customers. AIS is an ISO 9001:2008 certified supplier and manufacturer of rugged computers and displays, and received completion of the International Traffic in Arms Regulations (ITAR) registration from the Directorate of Defense Trade Controls (DDTC). For more information, visit: www.aispro.com, email: sales@aispro.com or contact: 1-888-485-6688.